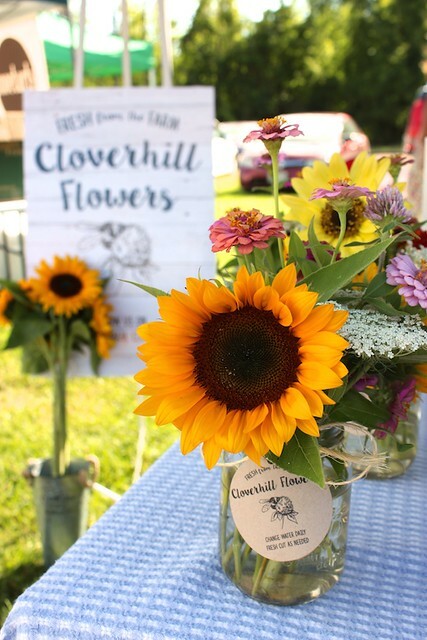 When we first moved into Cloverhill Farmhouse last year, we didn’t know what to do with the back quarter acre of plowed farmland. We threw down red clover and the last of the wildflower seeds from our wedding, as a quick ground cover, but now we needed to come up with a real plan. 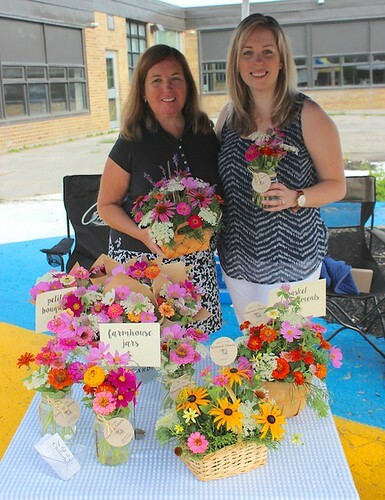 My mom and I started talking about growing a vegetable garden and maybe some more wildflowers…which somehow turned into selling flowers at a farmers market. 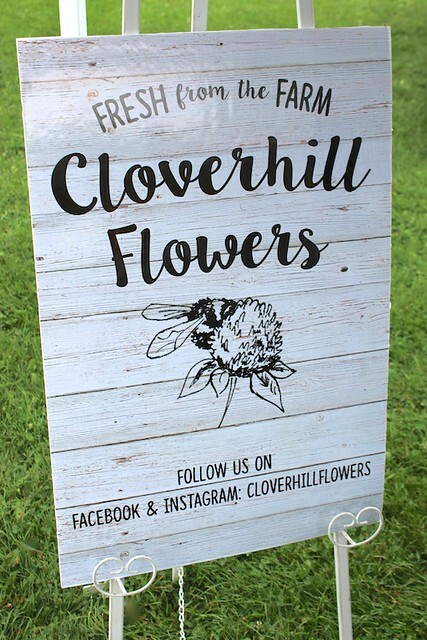 That’s how our new business Cloverhill Flowers was born! 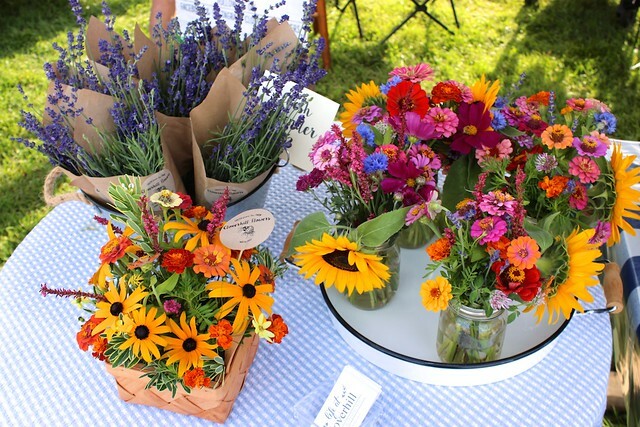 Now with four weeks at the market under our belts, I think it’s safe to say we’re officially small scale flower farmers. 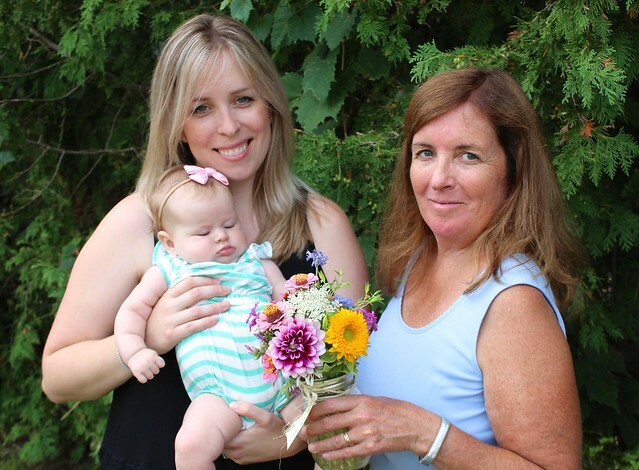 It’s been so much fun doing this with my mom while I’ve been off on maternity leave. Most days she is over to work in the field, which has been a huge help when I’ve needed an extra set of hands with Lucy so I can shower or make a sandwich. And it’s a good incentive for Lucy and me to get outside to enjoy some fresh air too. 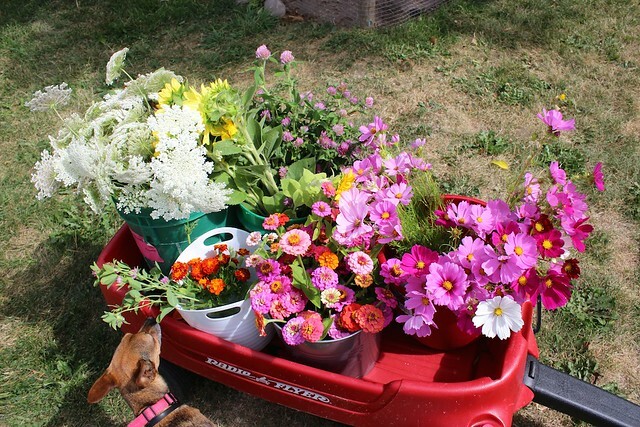 Every week, we cut our flowers, pick up any other local flowers we need and package it all up for market. My mom is a talented florist (she used to have her own shop!) and handles most of the detailed arranging, while I do the packaging and marketing. 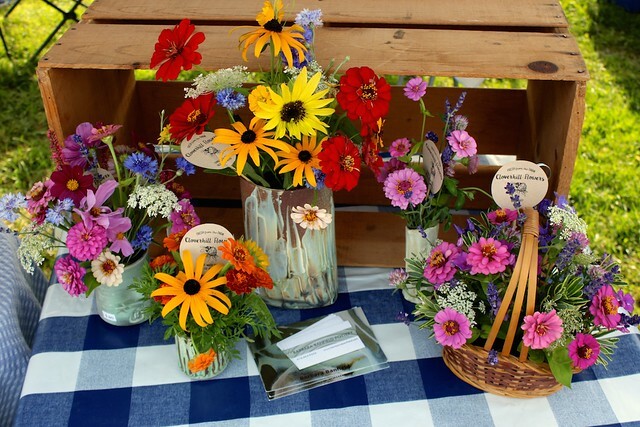 My aunt Barbara Banfield is an incredible potter and made us some beautiful pieces to showcase our flowers. I’ve shared her work before on my posts about the Toronto One of a Kind Show. 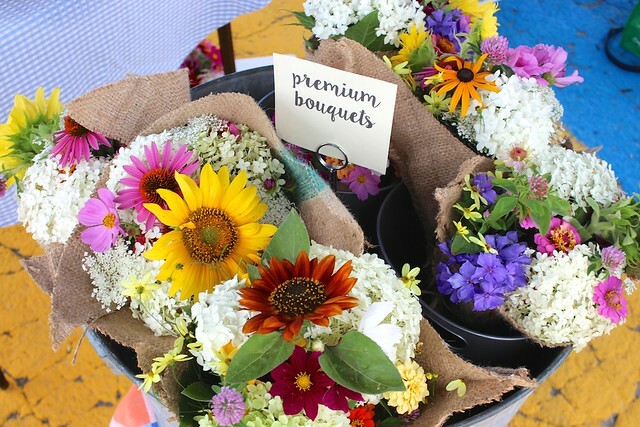 For our larger premium bouquets, we wrap them with repurposed burlap coffee bags from Green River Coffee. 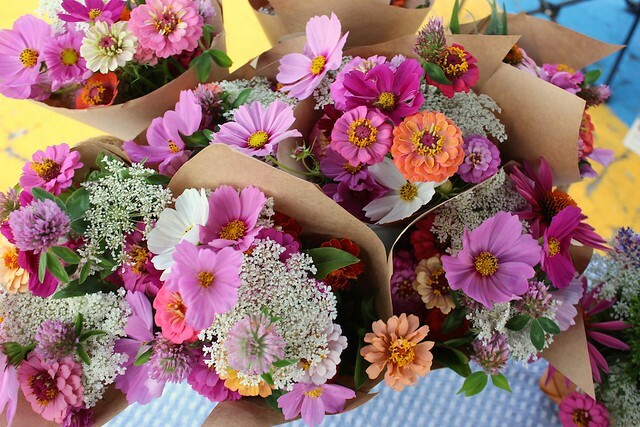 These petite bouquets in brown paper were one of my favourites – with our signature red clover. 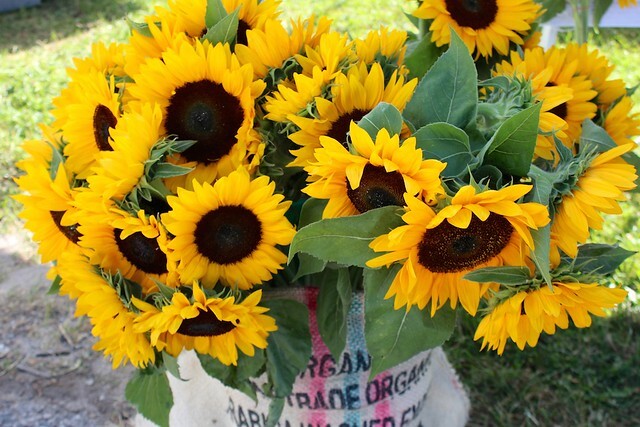 We found a great local farmer who grows huge sunflowers. 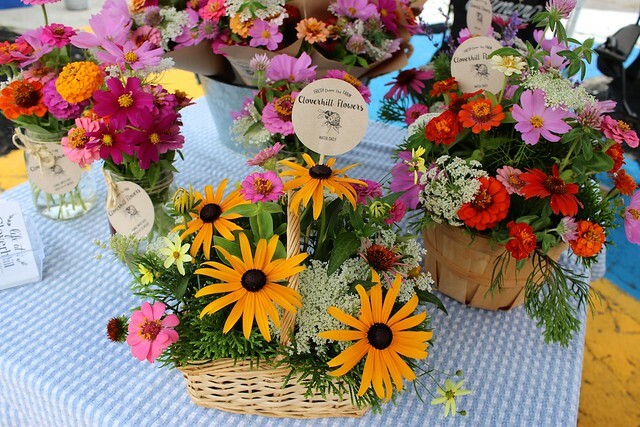 We’ve grown our own for arrangements, but it’s nice to be able to sell some of these larger bunches as well. 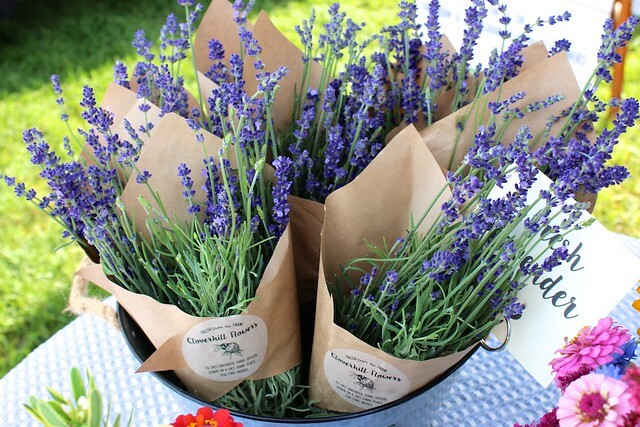 We were also able to find some lush and fragrant local lavender. We sold out of it in our first hour this week! 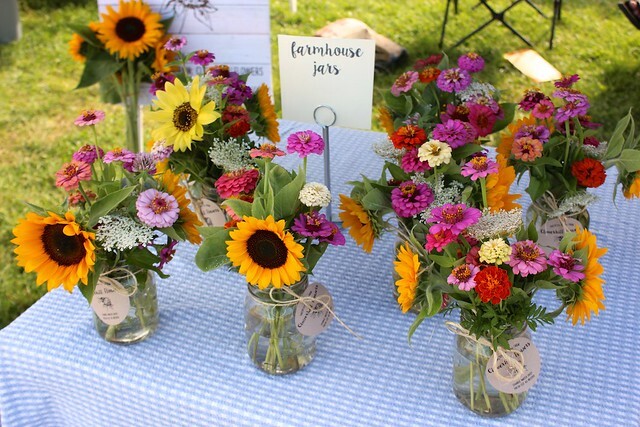 All the planning began last winter, when we ordered our flower seeds and started to plot out the garden. By springtime, we were ready to plant…although I had a big belly getting in the way of all the gardening! My mom and I spent Mother’s Day this year planting the majority of the seeds, just two weeks before my due date. 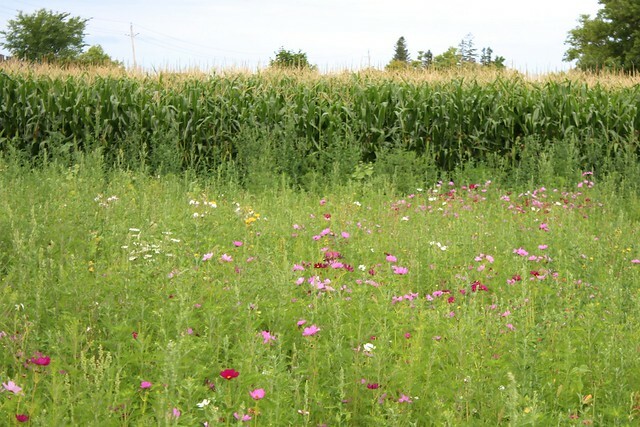 Now our fields are full of wildflowers…with lots of butterflies and bees flying around. It’s quite the hub of activity out there! Most of the summer we were in a severe drought, so we may have picked the worst year to learn how to grow flowers, but thankfully we’ve been able to get some lovely blooms every week. 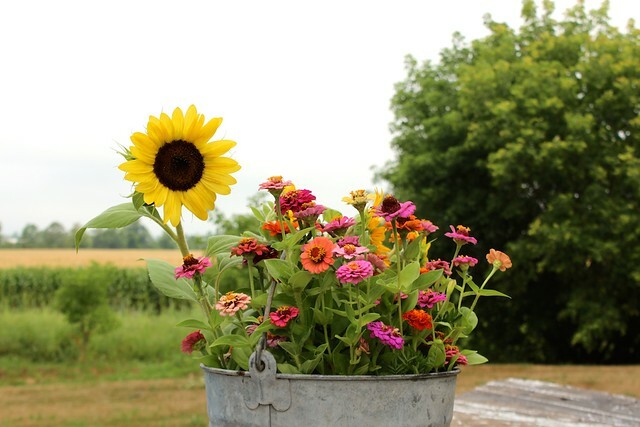 We’ve had Cosmos, Red Clover Queen Anne’s Lace, Sunflowers, Zinnias and Marigolds – and we’re already making field notes about what to plant next year! 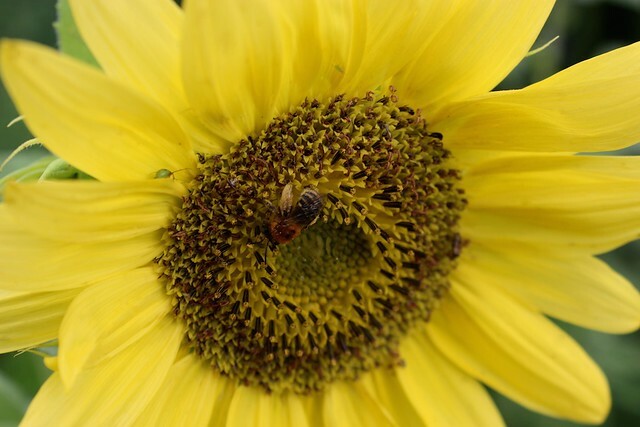 It’s been great to see so many pollinators out there as well. Getting to cut and sell our own flowers is great, but knowing that we’re giving these little critters a safe haven is really the icing on the cake. 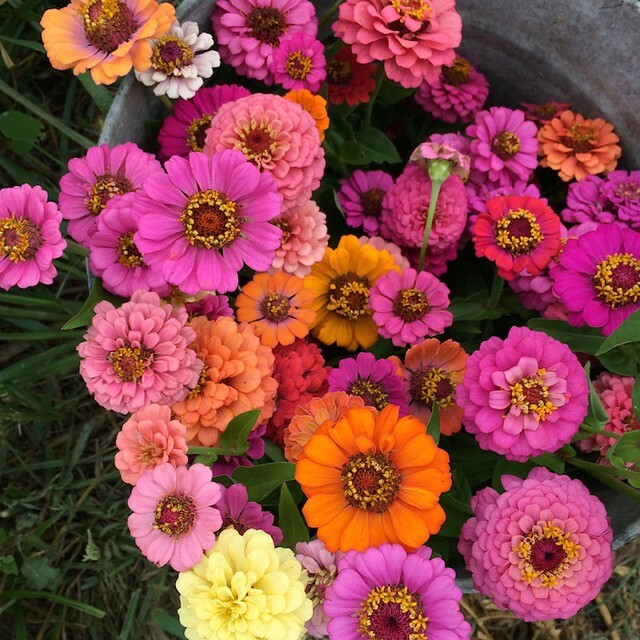 Every weekend we head out to the field to cut our goodies for the market, and I can’t wait to see the buckets full of blooms. Even Whiskey can’t resist giving it all a sniff! When we pick up our sunflowers, it’s always a little tight in the car, but somehow we manage to fit Lucy in there too, ha! 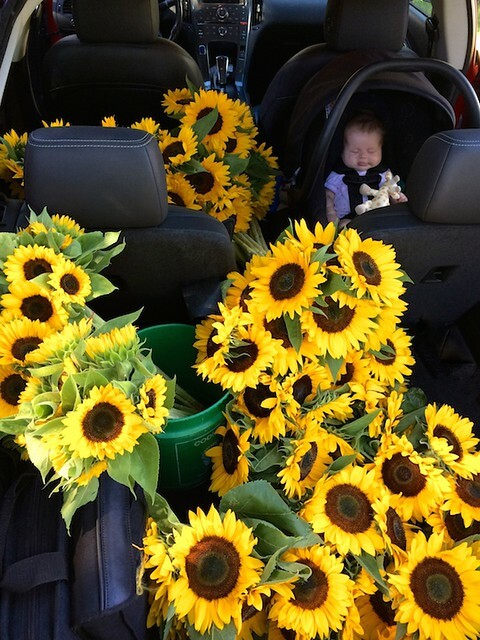 This is what 130 sunflowers and a sleeping baby look like! 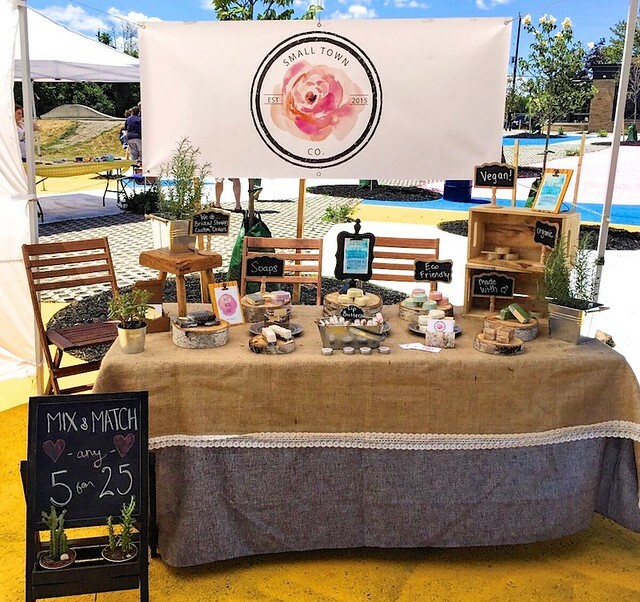 It’s been so nice becoming a part of the farmers market community as well. 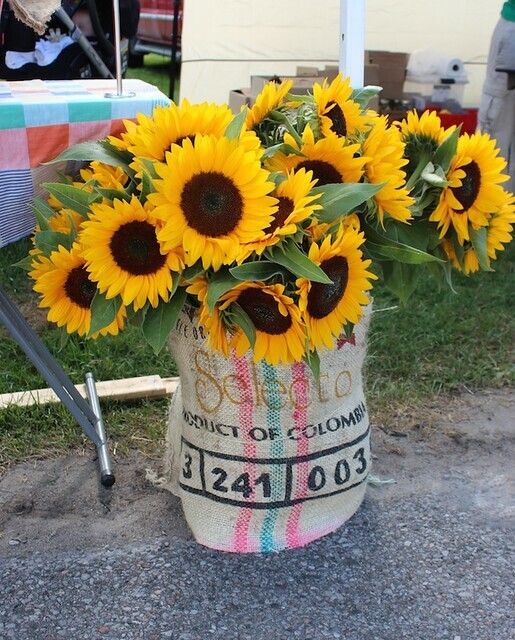 You really get to know the vendors and I love being able to pick up local produce and goodies while we’re there. I love getting the chance to play around with the flowers as well, and do something really creative. There is no better feeling than when you have a repeat customer come up and tell you how happy your flowers made them all week. We’re already had some custom orders for birthday parties and small weddings, and I can’t wait to see where this new adventure takes us. A few years ago I could never have imagined that I’d be living in a big old house in the country growing flowers, but here we are. It’s amazing how life can change and evolve without you realizing it. I’ve been following you guys on Instagram — what a sweet idea! 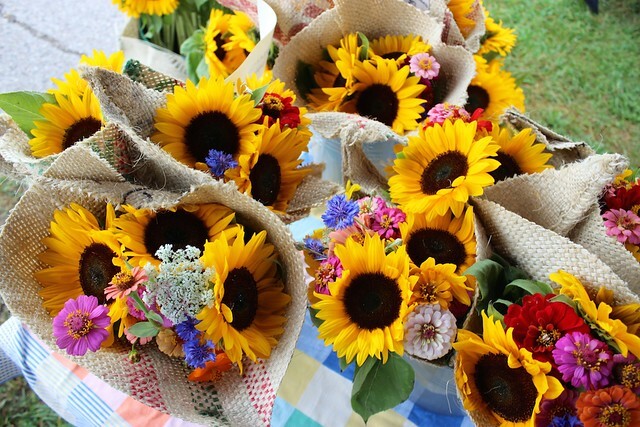 The flowers are so gorgeous. Who designed the logo by the way? I love it! Thanks Lor! My sister drew the logo using an image of a bumblebee in our red clover patch.